The eight-day spring-driven movement, which is situated in the base of the case, has a going train only. 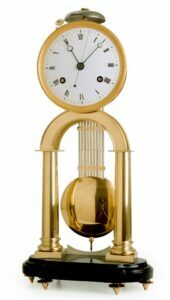 It has cylinder escapement with hair-spring balance and regulation. 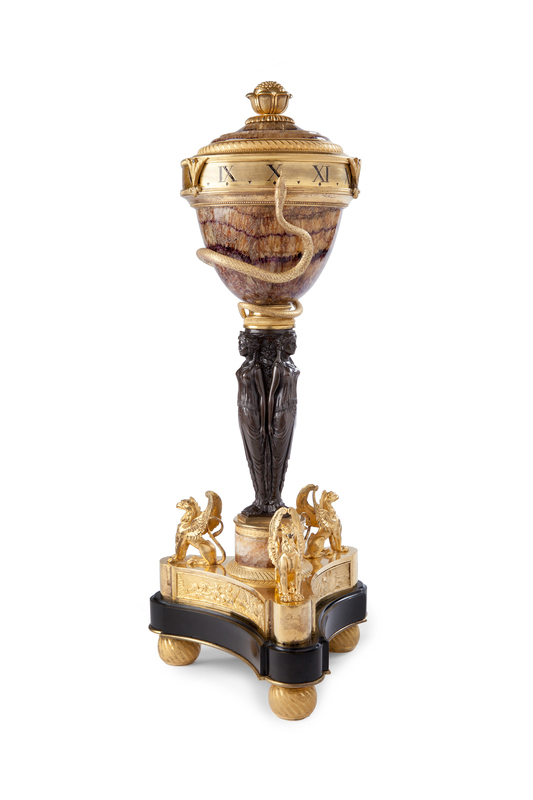 The gilt-brass revolving chapter ring (cercle tournant) of this mantel clock has Roman hour numerals with half-hour divisions, the time being indicated by the head and tongue of a fixed gilt-brass hand in the shape of a snake. 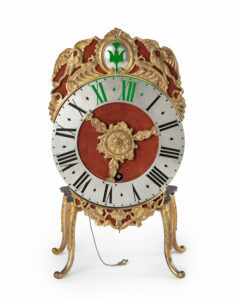 The case of the mantel clock consists of a black marble triangular base with hollow sides, one with the winding hole. The triangle is surmounted by a smaller similar shaped gilt-brass triangle with relief panels to the sides, depicting mythological scenes. 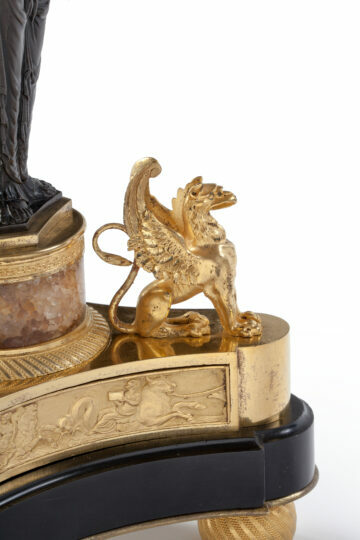 On the corners are three sitting gilt-brass griffons. 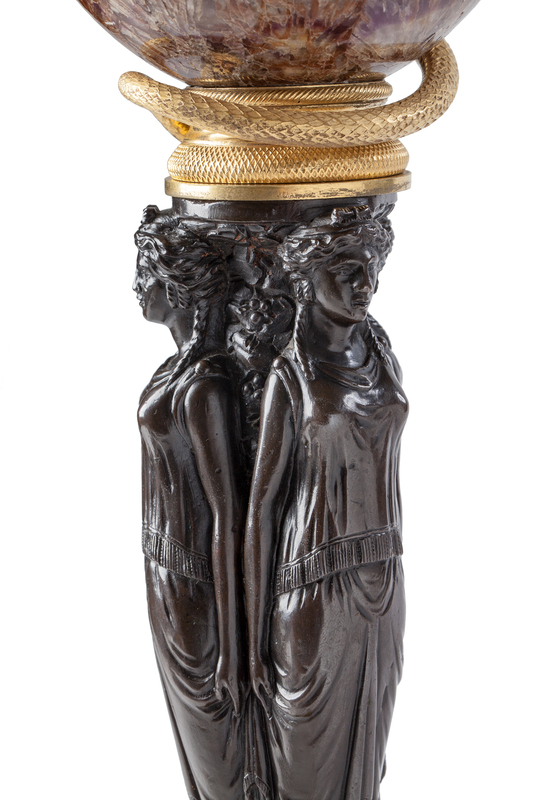 The patinated cast-bronze middle depicts the three graces with their backs against each other. They carry a Blue-John marble cup, which has the gilt brass revolving chapter ring at the upper edge. It is driven by a mechanism connected to the movement in the base and running through the middle part. 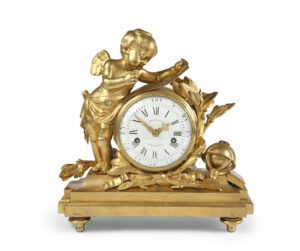 The clock is surmounted by a gilt-brass and Blue John lid with a knob in the shape of a stylised lotus. The hole rests on three engine-turned ball feet.